In its 15th year, the two-day Sisters Empowering Sisters (SES) conference by Image Initiative Inc. continues its mission to enlighten, engage and empower young women from underserved populations in the Syracuse community on core issues: self-esteem, relationship violence, sexually transmitted diseases and HIV/AIDS awareness and prevention, teen pregnancy prevention and conflict resolution. Hosted at Syracuse University, the conference also provides workshops that focus on higher education and career choices. This year’s conference took place on Friday, March 22, and Saturday, March 23, in the Schine Student Center. Walking into Goldstein Auditorium on Friday morning, the excitement, fun and comfort of the conference could be felt by every attendee. 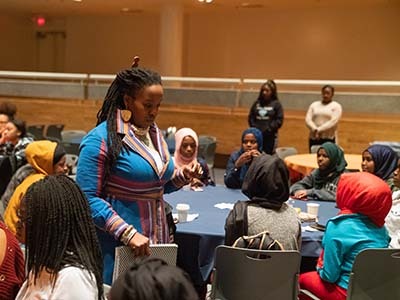 Over 150 African-American, Latina and African women, between the ages of 13 and 18, from the Syracuse City School District and local Syracuse community centers flooded the auditorium: registering, grabbing breakfast and finding a table to fellowship with classmates. It was the start of a transformative weekend for the young women. SaQuota Reaves ’13 welcomes attendees to the 15th Sisters Empowering Sisters Conference. SaQuota Reaves ’13, a teacher at the Syracuse Academy of Science Charter School and ambassador board member of Image Initiative Inc., was the first to welcome attendees. 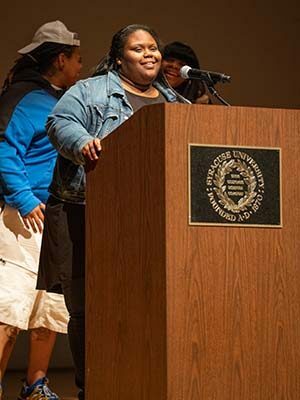 As she approached the podium, her students in the audience cheered her on. Fifteen years ago, Reaves had been in the same seats as her students—attending the first-ever SES Conference as a participant. “I came to this program broken. I needed a place that was safe and secure and would allow myself to step into my own person. This organization gave me room for that and opened up doors I thought I would never be able to walk through,” said Reaves. Reeves entered SES a “broken bully” and left with the drive to be and do better. Five years later, she graduated from Syracuse University with a degree in African American studies and women and gender studies, both in the College of Arts and Sciences. She is currently pursuing a master’s degree from Grand Canyon University in special education and is publishing a book. The magic behind the conference and Image Initiative Inc. comes from Nicole Watkins ’93, G’98, G’03, founder and president of Image Initiative Inc. When Watkins was making a decision on what to do after high school, she realized it was not so much a decision for her to make but one her mom had made for her. Watkins, who ultimately attended Syracuse University, was the only person in her immediate family to attend and graduate college at the time. Ten years later her mother joined her as a student at Syracuse. Nicole Watkins holds the proclamation sent by Senator Rachel May to Image Initiative Inc. recognizing its work on the 15th conference. After graduating with a bachelor’s degree from the College of Visual and Performing Arts, Watkins went on to earn an MBA from the Whitman School and an M.A. from the Newhouse School. Two years later, while continuing her education through a certification program in the Maxwell School, Watkins created Image Initiative Inc. as part of her coursework in Mary Tschirhart’s class. Katina Stapleton, another former Maxwell professor, was Watkins’ initial advisor and eventually became a founding board member. Image Initiative Inc. has multiple programs in which the experience culminates with the SES conference. Throughout the year, it provides consistent programming through the CHOICE Experience on skill development and life enhancement, Cultural Excursion Program that exposes students to environments and cultures beyond Syracuse, and the BUILD Mentoring Collective of mentoring. The continuing programming and conference are made possible by a Board of Directors, Advisory Board and Ambassador Board. Collectively, the 15-person Board of Directors has over 15 degrees from Syracuse University, ranging from bachelors to doctoral degrees, with more in the works. Many are also current or former employees. On the board are women that have been with Image Initiative Inc. since its inception, including Tiffany Rush ’93, LaRhonda Ealey G’16, Jossette Burgos G’17 and Vanessa Chaves-Asforis ’04, G’04. 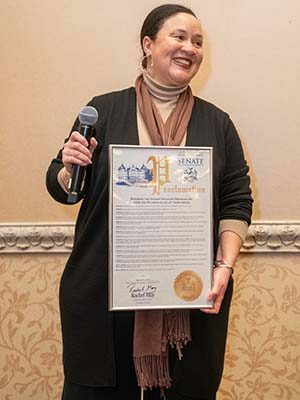 Chaves-Asforis returned to campus for the conference this past weekend—her first time back since 2004—because of the anniversary and the message she wanted to share with the young women. Vanessa Chaves-Asforis leads a mindfulness workshop for over 150 attendees. Given her upbringing in a violent environment, Chaves-Asforis felt she always needed to be on alert—a feeling she believes many young women attending SES also feel. Chaves-Asforis, now CEO of a lifestyle brand, eventually learned how to be present and found sustainable mindfulness practice. This desire to provide the 13 to 18 year olds the resources and skills to create the life they want is universally held by the dozens of volunteers at the event. Primarily all women of color, the volunteers came from across the country to engage, enlighten and empower students that many saw as themselves at one point in time. One of the most poignant moments was when the women volunteers called out their sororities’ roll call. Sounding off, each of the four sororities from the Divine Nine were represented. 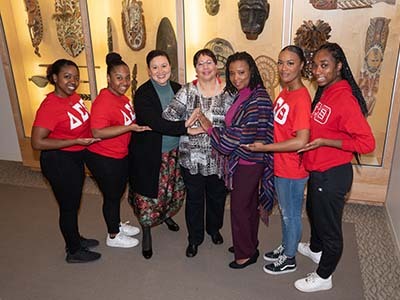 That lineage is represented through current Syracuse University students, who continue the tradition of Divine Nine involvement, particularly Watkins’ sisters from Delta Sigma Theta Sorority Inc.
Sisters of Delta Sigma Theta Sorority Inc. have participated in Sisters Empowering Sisters since its inception and continue to support the program 15 years later. “Women of Delta Sigma Theta Sorority Inc. always lead by example and seek to fill gaps, even if they go unnoticed. It reinvigorated us to see Nicole Watkins in action as it was a physical reminder to hold true to our principles and continue to serve our respective communities,” says Savannah Taylor ’20, chapter president of the Kaptivating Kappa Lambda Chapter of Delta Sigma Theta Sorority Inc.
For more information or to support Image Initiative Inc., visit http://www.imageinitiative.org/.